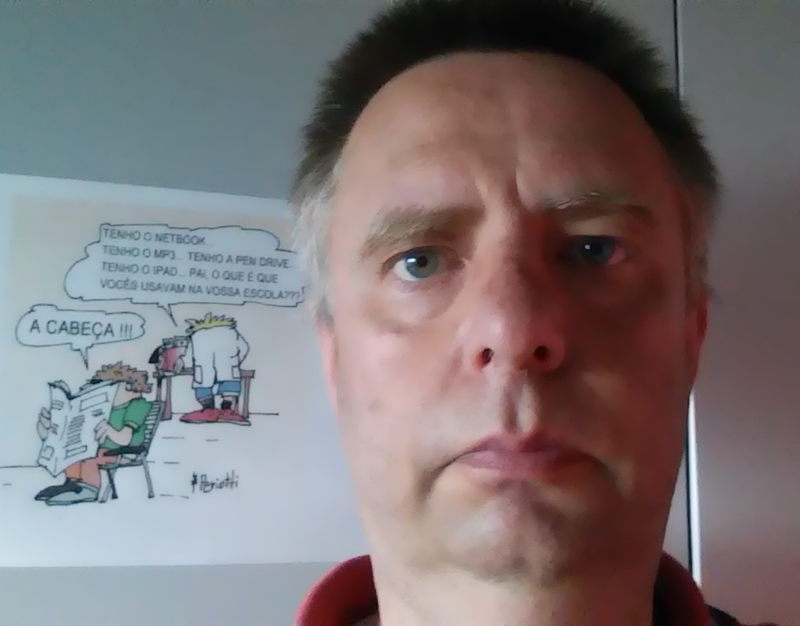 Andrea Baccarini, Claudio Mazzoleni and Lynn Mazzoleni were interviewed by David Borges, a local newspaper reporter in Madalena, in July 2015. Here’s the newspaper story that resulted from our talk. This story was translated using Google Translate. 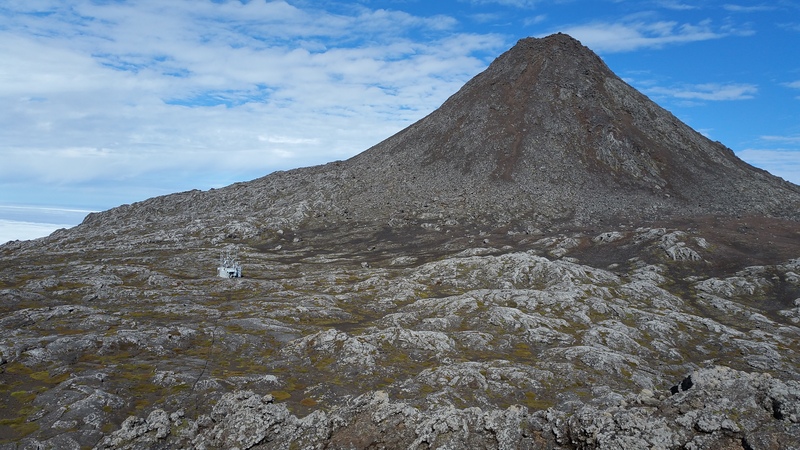 The station ‘Pico NARE’ that is placed in the mountain crater remains an observatory of excellence to study air pollution that flows in the North Atlantic. 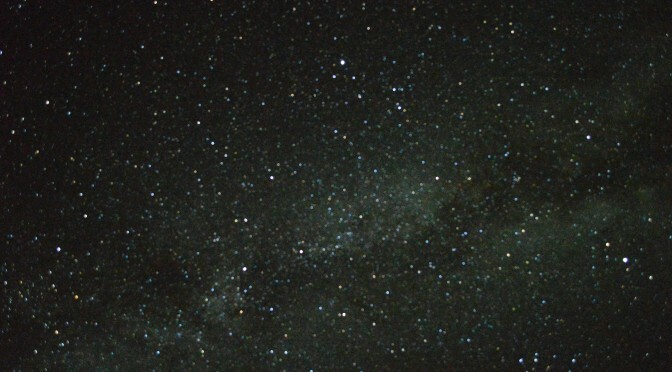 The scientist Lynn Mazzoleni, which in recent years has used the observatory to develop various types of studies, said that despite the difficulties to ensure the necessary funding the observatory will not close. According to the scientist at Michigan Tech, in addition to the United States’ interest in all that relates to the climate, Portugal is also aware of the Observatory; there is even a large group linked to the investigation of the atmosphere and the chemistry that has a proposal to use station as a privileged place to develop various atmospheric studies. In addition to this work, one of the currently ongoing studies at the ‘Pico NARE’ is being developed by a student of the Italian University of Trento. 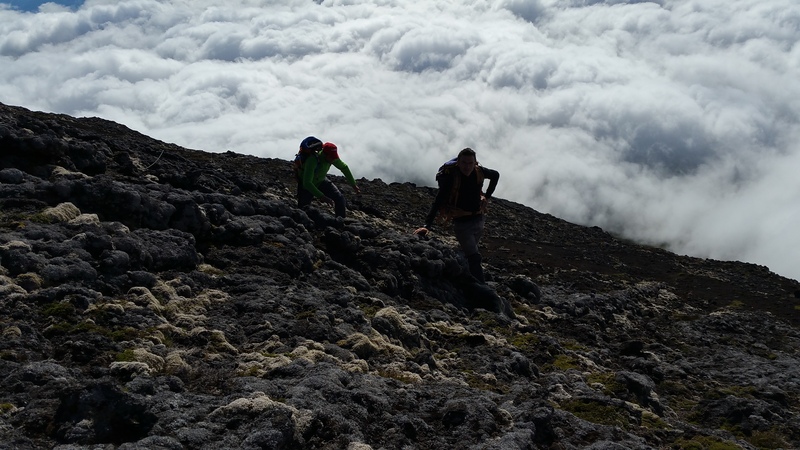 The work consists of going up and down the mountain with portable instruments to improve the accuracy of measurements, trying to characterize the vertical composition of aerosols in the atmosphere. 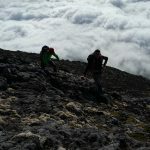 The student of the Italian university said it would be possible to carry out the job at Pico Mountain, because the instruments can go in your backpack. However, he clarifies that the ‘Pico NARE’ station contributes to more accurately compare and confirm measurements with those of portable instruments. Andrea Baccarini does not know when he will have to present conclusions, but he expects that by the end of the year have been able to work all the collected data and he will present the results as soon as possible. 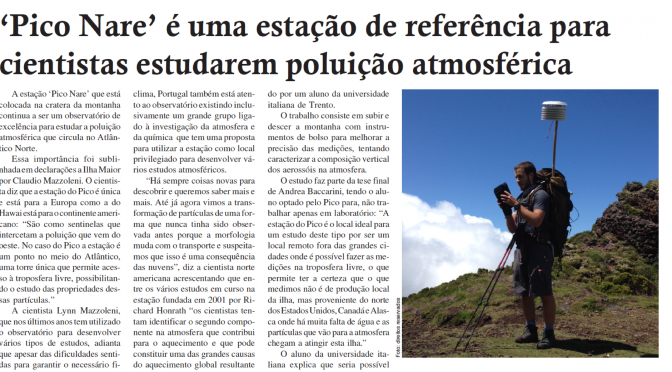 Dr. Fialho is a founding collaborator of the Pico Mountain Observatory. He has been measuring black carbon at the site since 2001. 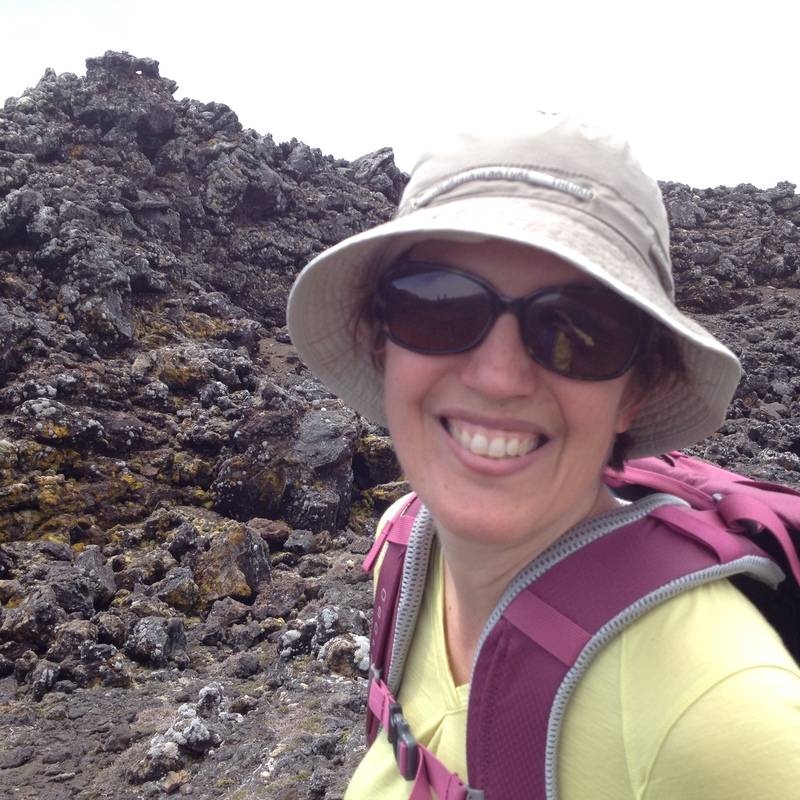 Dr. Fialho is the primary point of contact for activities at the Pico Mountain Observatory. Kendra Wright, Lorentyna Harkness , Claudio Mazzoleni e Lynn Mazzoleni foram entrevistados por David Borges, um repórter de um jornal local em Madalena, em julho de 2013. Aqui está a história jornal que resultou da nossa conversa. 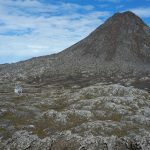 A Universidade Tecnológica do Michigan, com o apoio da Fundação Nacional de Ciência, do Departamento de Energia dos Estados Unidos e da NASA, está a desenvolver dois novos projetos na estação Pico Nare instalada no topo da montanha do Pico para estudar o efeito climático dos aerossóis. Os projetos, com dois e três anos de duração, baseiam-se no estudo das propriedades químicas e também das características óticas das partículas como a cor e a forma que determinam a sua interação com a luz solar. Na estação colocada desde 2001 na cratera da montanha os especialistas esperam observar aerossóis provenientes do continente americano, resultantes por exemplo do fumo de grandes incêndios localizados sobretudo na parte norte do continente, com origem no Canadá e/ou Estados Unidos da América. 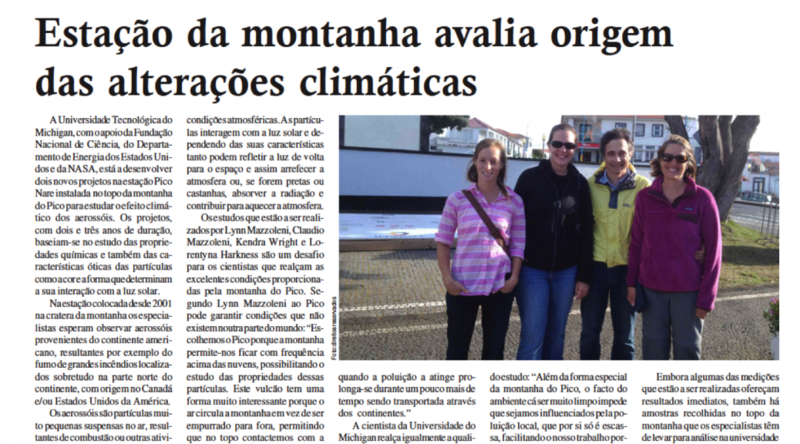 Kendra Wright, Lorentyna Harkness, Claudio Mazzoleni and Lynn Mazzoleni were interviewed by David Borges, a local newspaper reporter in Madalena, in July 2013. Here’s the newspaper story that resulted from our talk. 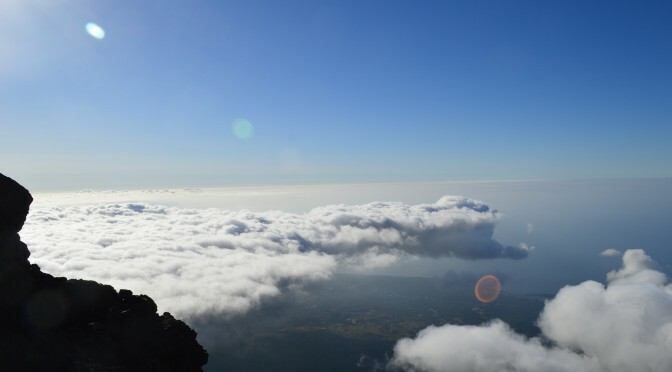 The Michigan Technological University, with support from the National Science Foundation, the Department of Energy of the United States and NASA, is developing two new projects in the Pico Nare station installed at the top of Pico Mountain to study the climatic effect of aerosols. The projects, with two and three years in duration, based on the study of chemical properties and also the optical characteristics of the particles as color and shape that determine their interaction with sunlight. 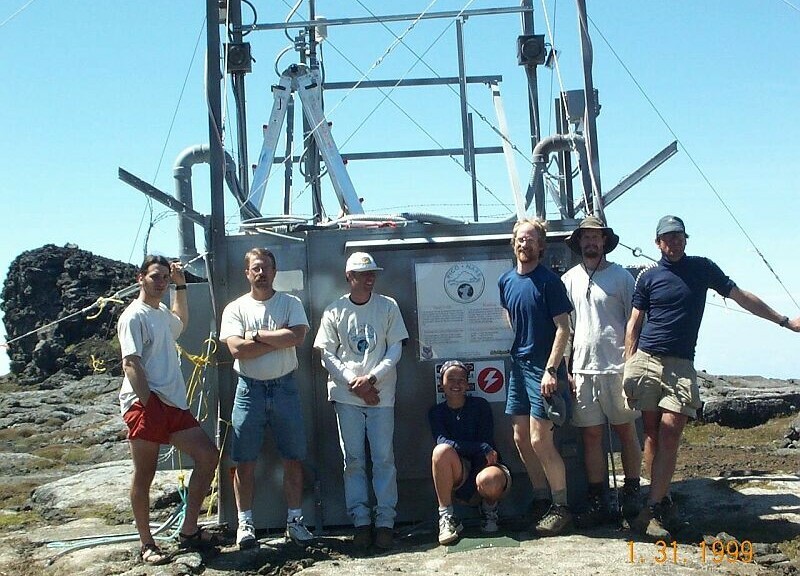 Placed at the station since 2001 in the crater of the mountain experts expect to observe aerosols from the Americas, resulting eg smoke from large fires mainly located in the northern part of the continent, from Canada and/or the United States of America. Lynn and Claudio Mazzoleni were interviewed by Kevin Hodur for the 2015 Michigan Tech Research Magazine article. Here’s an excerpt of the story. 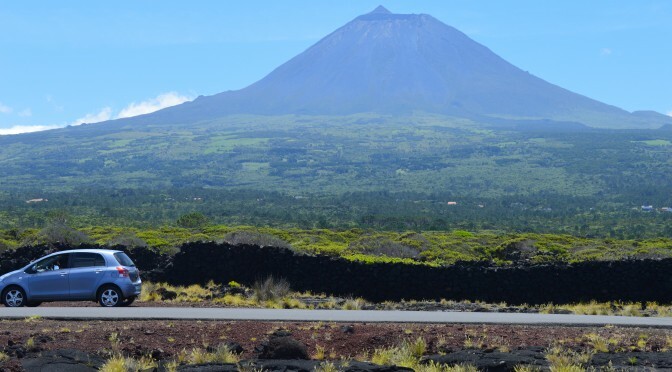 Deep in the eastern Atlantic, roughly 900 miles west of Portugal, lies the tiny island of Pico. On maps, it looks like nothing— hardly more than a pinpoint in a sea of blue. 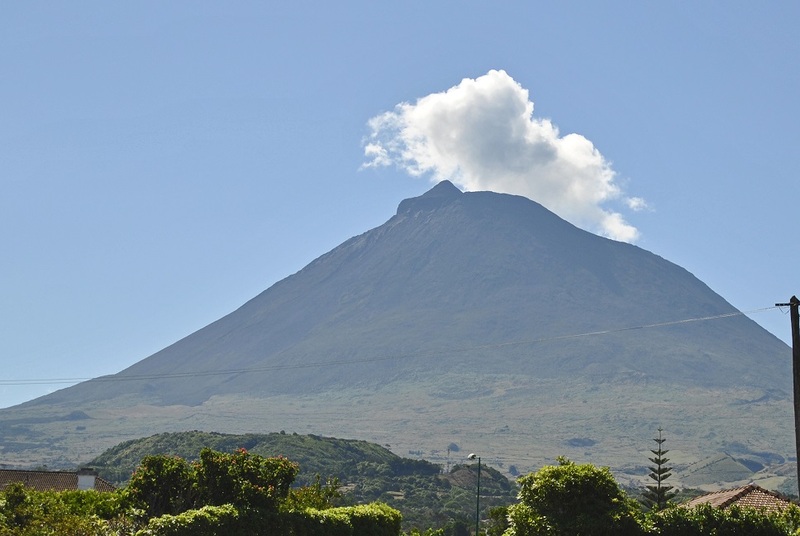 But to atmospheric researchers, the remote island’s towering Pico Mountain holds the key to understanding how aerosols may impact climate change. 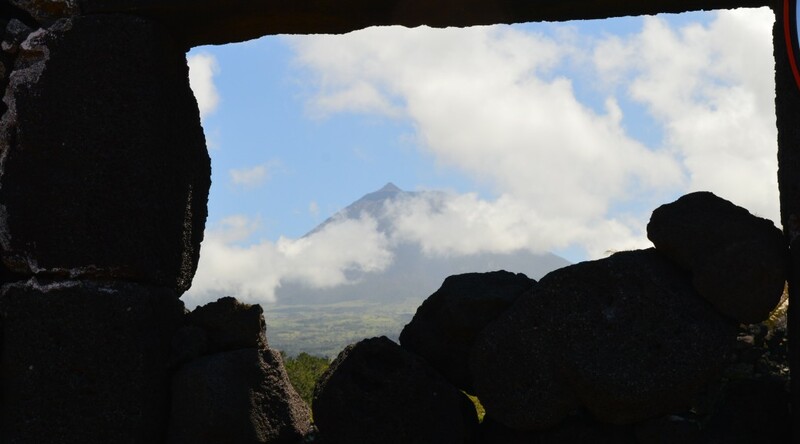 Pico Mountain is one of nine volcanic islands that make up the Azores archipelago. 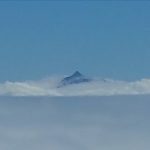 Its size, however, sets it apart: at nearly 8,000 feet, it’s one of the highest mountains in the Atlantic and more than twice the elevation of neighboring peaks. 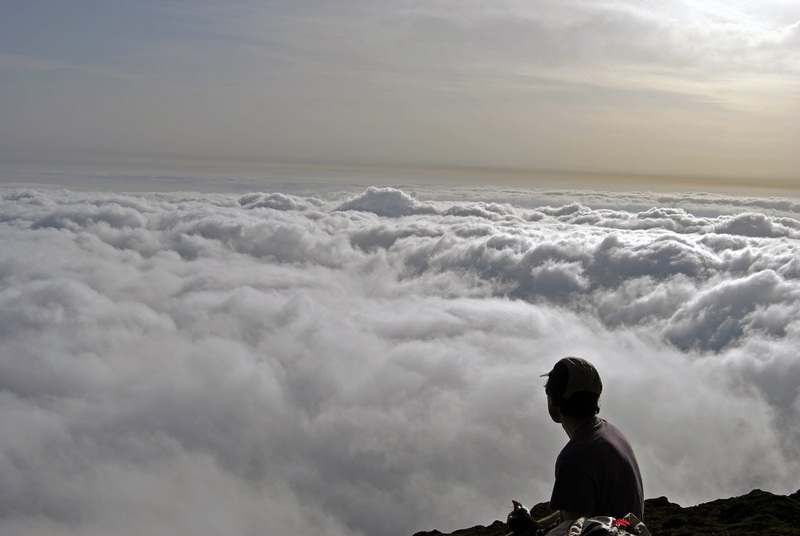 To hike to the top is to enter an entirely new world, up in the clouds. 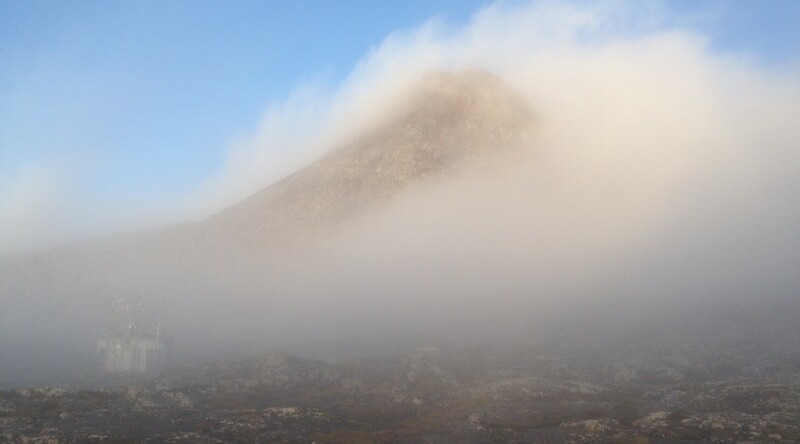 It is the high altitude—along with Pico Mountain’s isolated Atlantic location—that make it the ideal place to study aerosols. These high-in-the-sky aerosol particles are what interest Michigan Tech researchers. 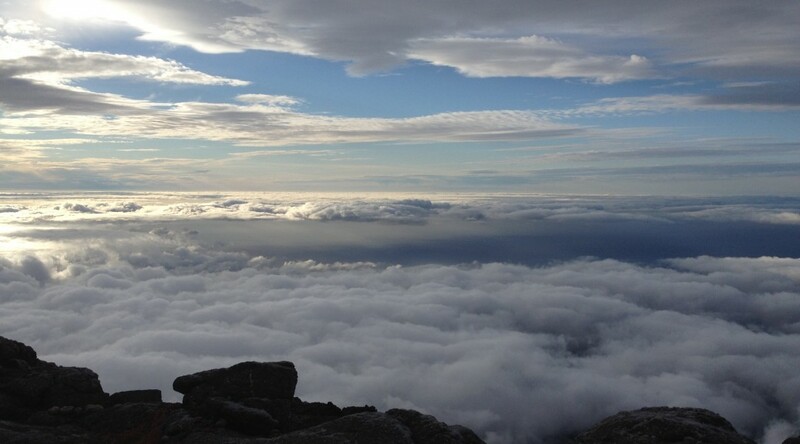 For years, they have worked with collaborators to sample particles atop the peak at the Pico Mountain Observatory, learning more about the sources and characteristics of aerosols. 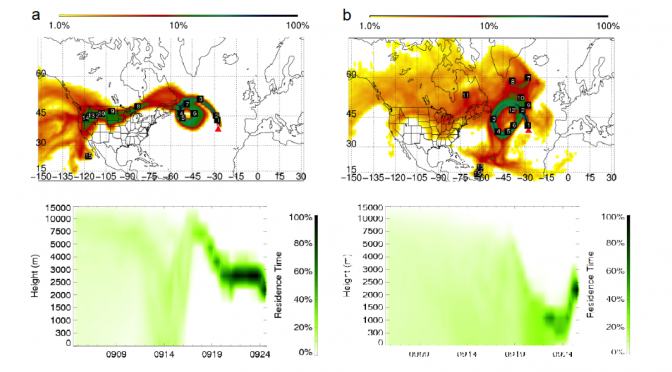 These aerosols have a large but not completely understood influence on our atmosphere. 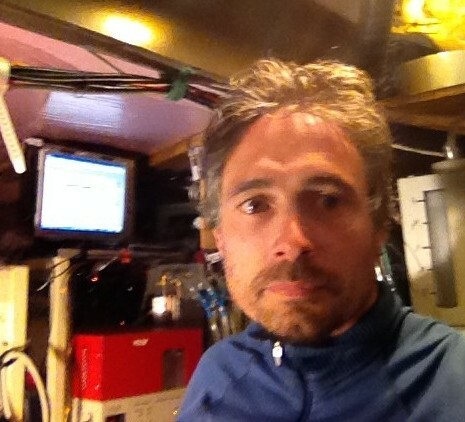 Dr. Mazzoleni is the principal investigator of the Department of Energy funded research at the Pico Mountain Observatory to study the optical properties of aerosol above marine clouds. 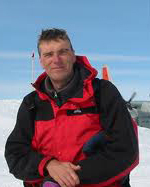 His group’s most recent technical publications from this work include: “Morphology and mixing state of aged soot particles at a remote marine free troposphere site: Implications for optical properties” and “Perturbations of the optical properties of mineral dust particles by mixing with black carbon: a numerical simulation study“. 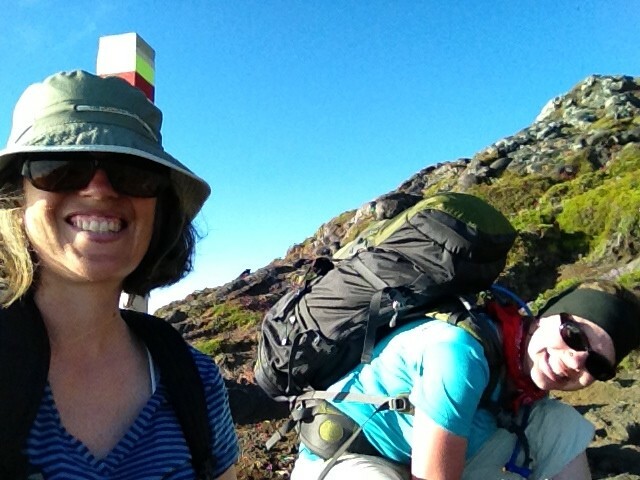 “I was out in the field on the island with the team for part of last summer,” Harkness says. Lorentyna Harkness and Lynn Mazzoleni sat down with Michigan Tech reporter, Danny Messinger, to talk about our outreach activities for this project. Here’s an excerpt of the story. If you ask an eighth or ninth grader what a scientist really does, you’re likely to hear plenty about wearing lab goggles and white coats, watching bubbling beakers, and preparing microscope slides. But besides surface-level attributes, many students have trouble explaining what being a scientist actually entails. That’s exactly the issue Lorentyna Harkness aims to tackle. Harkness is a high school science teacher earning a master’s in applied science education at Michigan Technological University. As part of her degree program, she is teaming up with Tech chemistry and physics faculty to break complex scientific principles into bite-sized chunks for teenage students and to clarify what scientists actually do. And that’s music to Lynn Mazzoleni’s ears.